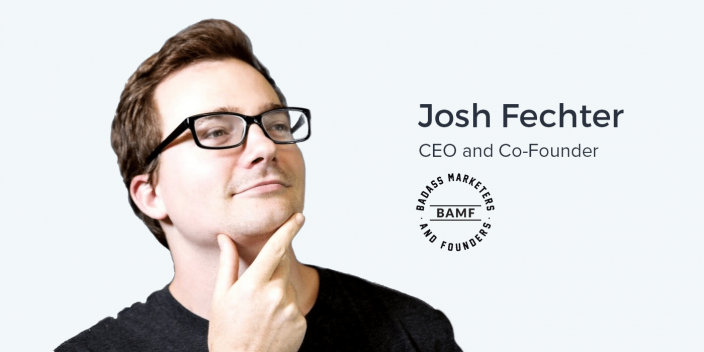 Josh Fechter is an award-winning growth hacking expert, marketing thought leader, social media influencer, and master of building communities. Central to his most impressive accomplishments is Badass Marketers and Founders, also known as BAMF, a highly curated Facebook community of over 15,000 growth professionals founded by Josh. BAMF includes BAMF Media, a full stack growth and marketing agency. It also includes BASH, a program to empower B2B marketing executives to become social media influencers. Josh’s credentials extend far beyond his expertise on Facebook and LinkedIn, where he has amassed over 25 million profile views. He was also named a top Quora contributor of 2017, and has published his writing in over sixteen publications. Recently, he launched the BAMF Bible, the #1 Book ever on Product Hunt. Any time you read a brief bio of Josh, you learn something new. It’s impossible to contain his successes into a few short paragraphs. Some marketers assume user communities primarily have value for consumer facing companies or organizations looking to gain initial traction in the infancy of their product. However, large established companies still benefit from having active online communities of users. Even though larger companies might have the resources for creating powerful communities of power users, evangelists, or enthusiasts, an extra marketing manager doesn’t make transparency any easier. Transparency in a community among the members, facilitators, organizers, and anyone else involved is essential to the community’s success. Speaking openly about your failures also allows you to more effectively showcase your successes and demonstrate your ability to overcome obstacles to your user base. In the same way that some marketers incorrectly rely on quantity of leads over quality, the quality of the users in your community creates a far greater impact than a oversized group of mildly associated individuals. Highly curating your communities will also provider an enhanced level of engagement and allow you as the community manager. This same thinking can be applied to your advertising. Make sure that your targeting is geared towards an audience that is inclined to give you the most support. Ander: Well, this is very cool, especially considering that the last episode was with Hailey Friedman who has taken over the Badass Marketers & Founders community in the San Francisco Bay Area. Today we’re talking to the original guy, the guy who started it all, Josh Fechter. Josh, thank you so much for taking the time to hop on this podcast with us. Really excited to have you here. Josh: Thank you for inviting me. I really appreciate it. You know, I’ve heard a couple of episodes before and it’s an exciting podcast to be on. So, thank you. Ander: And my understanding is that you just got back from a trip to Australia, you just moved to Venice, you just started a new business. You’ve got a lot going on right now. Josh: Yeah. I just came from Australia. I was there for kind of for a two week vacation and I was helping out startups. But I wasn’t completely focused on sales. Had a lot of fun. Did some speaking events. Spoke at Growth Hackers Australia as well as worked with an accelerator that’s under QT Enterprise and they have some really good startups there. I would say they even compete with, like, the Bay in the quality of start-ups, not in the number. Josh: I was really surprised by that because I’ve been to a number of places and I hadn’t seen people keeping up with Silicon Valley at all. I’ve been to Toronto, Vancouver, and they’re far behind. But Australia is pretty close and I think it’s because they have a large e-commerce culture. Ander: Yeah, that’s really interesting. And I’ve heard that from multiple people. Glad to hear you say that. It’s always interesting to learn that stuff. Josh, I explained about it a bit in the introduction to this podcast but it’s going to sound much better coming from you. Obviously you’ve got this pretty robust professional history and you’ve got this fascinating story, so I think the best way to get started with the marketing content here in this podcast is to hear that story. How did you get to where you are today? I know it’s not that simple! So a week later I created a blog, just on wordpress.com and I was very new to the whole guest posting thing. I had never heard of it but I needed more traffic so I asked my friend to write on my blog. And he writes a piece on my blog, he shares it on his profile, and I get more traffic. And there’s this big ‘aha’ moment that goes off in my brain. I’m like, ‘Oh my god. What if I had a hundred of these people writing for me?’ And what I did is I turned to my friend and my friend was actually the first person to guest post on my blog and I made him my co-founder. We decided to turn the blog into a publication. So I taught myself web dev from scratch as well as how to recruit people. At that time it was relatively easy. Facebook actually let you get into anybody’s inbox that as long as you had one friend in common – or you could just pay a dollar to get into their inbox at the time, which was an interesting feature. So within three months we had a hundred and fifty writers just through massive outreach and then part of the problem that came with that is that we had to correct their content. And I didn’t have the background in writing, in fact I was one of the worst writers I knew! I just found out some cool hacks on the internet and now I have to edit the work of a hundred and fifty writers. Ander: Yeah, that certainly is a piece of work. Josh: Haha. So I recruited a couple of editors. They jumped on board and they were just peers of mine. They weren’t, you know, the best editors in the world but they were people I knew and I needed manpower. And what I realized is that it wasn’t too hard to get traffic to a website at that time. We were paying Facebook just a little bit of money and we were getting around 24,000 visitors a day because it cost us, like, 1/10th of a cent per click. And Facebook ads were just so generous. Nobody was using them at the time and I think that there was just a bit of a learning curve to technology. Now it’s much, much more saturated which makes sense, you know, people get it. But then, it was just a free game. So we took advantage of that and when we were getting all this traffic, we had to figure out how to make money, right? We’re working with affiliate programs, like Google AdSense, and Taboola… The problem is that these technologies like Google AdSense weren’t that advanced at the time so they’re telling you, ‘We’re going to show a relevant ad on your article.’ And it’ll be an article about travel and they would show an ad about bananas. Totally irrelevant. We weren’t making any money off our ads so we tried all these different affiliate programs, tried monetizing through building an email list and none of it worked. So we ended up just shutting it down. And the funniest part about this is we actually modeled the publication after Elite Daily and we didn’t know at the time that Elite Daily wasn’t even profitable. Josh: And I think they ended up selling their company when they weren’t even profitable too. So we were following an unprofitable model trying to build our company, which is one of the worst ideas ever. Haha. Ander: Haha. Yeah, no kidding. Josh: Ah, it was great. And then what ended up happening is I’m like, ‘Ok, well I guess you have to get a real job now. You can’t be a founder anymore.’ So I wanted to work with people who are smart and smart people, to me, were people who worked at Amazon, Google, McKinsey… And I got a job as VP of Marketing / Co-founder of this company called Enjoyment. They’re Tinder for jobs. And what I realized within the first week… and it’s a funny story that ties into this – I had met this guy named Scott Case. He’s the founder of Priceline. And I shot him a cold email after a conference where I saw him speak and just asked him for coffee and he actually became my mentor during my time at my second startup. So I meet him for coffee first week at my new start-up and I say, ‘Hey, check out our app!’ And he looks at it and he tells me it’s basically the worst thing he’s seen. And he says, ‘Your company is going to fail.’ Haha. Ander: Haha. Not words you want to hear. Josh: And I’m like, ‘You’re the founder of Priceline and you’re telling me my company is going to fail, like, the first week in.’ That is brutal! Haha. Josh: And what ends up happening is he leaves this note though, that I remember still today, that I found so powerful because I said, ‘Oh, you know, we have smart people on our team. They’re from Google, they’re from McKinsey, they’re from Amazon.’ And he looks at me and says, ‘I want you to know something: when it comes to startup life, nobody knows anything!’ And I said, ‘What are you talking about?’ He sort of just looked at me, like I would eventually get it and then two weeks later, I got it. Josh: The problem is we just didn’t have any time. Our run way was very short so within four months we made a major pivot and then we pivoted again within another month, so I decided to leave. At the time I felt like I had all these skills, I had taught myself how to write well, I also taught myself how to recruit people, how to manage people, as well as just how to do web development, build beautiful publications. But the problem is, nobody cares about that when it comes to hiring. Everybody wants consistency. That’s the one value that they hold the most important. They’re like, ‘Will you be here for a while?’ So I interviewed at companies like Grammarly and other big tech companies. But the problem is none of them hired me and they said all the same thing: ‘Hey, we think you’re too entrepreneurial and we think you’re going to leave.’ Haha. Ander: Right, that sounds a bit familiar. Josh: That was a brutal experience. I basically ran out of all my money interviewing across California and what ended up happening was I ended up staying with my dad. My dad had a small apartment, just two rooms. We slept in the same room just so I could get back up on my feet and save up some money. And I eventually found a job as a copywriter which ended up being my most valuable skill today, which is funny because I thought it was the most miserable time in my life. Haha. Ander: Yeah, yeah. For sure. Josh: So I’m learning copy and I’m going every day writing about video editing software – because I worked at a video editing software company – in very technical detail. So I’m writing about after effects with Adobe products, right? And the thing about that is I didn’t know a lot about video editing. I wasn’t a video editing pro but I had to sound like the best so it took so much research and just the amount of effort I put into one piece was incredible. And now I do that over and again within the marketing world with the stuff I actually do. So I find that a little bit funny. Josh: So I jumped into this company called 22Social and they were so close to not hiring me which I find very funny. They had actually already filled my position but I wanted the job so bad that I spent around a couple of weeks really making a great proposal for them, and especially, like, two days. I just hammered out around twenty hours and it turned out to become a 20-page proposal of how I could help grow their company. Josh: Because I wanted the job so bad. I said, ‘This is my break. Like, everybody hasn’t given you a chance. These guys are doing something that’s cool. Jump onboard.’ And so they hired me. And what I learned at the company was one, you know, how to be a great CEO. They had a great CEO, just awesome founders in general that really mentored me and brought me up to speed. It’s one of the reasons I stayed there for a year even though I wasn’t getting paid that well. But also, I realized what it’s like to build technology too early for its time. 22Social was the first company to do livestreaming on Facebook. Josh: And at the time, we thought this was the coolest thing ever. I mean, this was two years ago, right? So it’s two years ago and we’re just screaming at people, like, ‘Check this out!’ and nobody cared. Haha. Ander: Yeah! Haha. Not an easy thing to do. Josh: It’s still hard today. People don’t use live-streaming. Ander: Yeah, we’re starting to really experiment with it at Facebook but we think it’s going to be a majorly awesome growing channel. Josh: Yeah, livestream is huge and the reason for that is that you can’t fake authenticity. It’s pure you being genuine and that’s something that’s missing from the internet at a large scale. Ander: I totally get that. Josh: So if you look at just people, how they interact on social media, you can schedule your posts, you can basically do everything in your power to make you seem genuine when you’re not. It’s a huge problem today and people want trust more than anything else and if you start livestreaming you’ll gain people’s trust exponentially faster. Ander: Josh, what was the point where you realized that you wanted to start this community – and I know that it wasn’t necessarily something that was hyper-intentional, but how did you come to tbe conclusion that you wanted to start aggregating these resources and putting together this powerful group of like-minded thinkers? Josh: Yeah, so it was actually when I was over at 22Social. I had started the community called San Diego Digital Marketing Experts – and this was before I even moved to San Francisco – and I started getting people there every single week, getting new speakers, similar to how I ran events in San Francisco. What I realized is that there were a ton of opportunities that came out of that. I got some good consulting opportunities. That’s actually why I left my job at 22Social, because people were willing to pay me, like, five times more to do consulting. It was just a big ‘aha’ moment. So in order to stand out, I took two months off and I wrote a book about Facebook marketing, like, all my learnings and I used that to leverage the job to become the Head of Growth for a company called About. And About was an event subscription company and what I love about them is they taught me how to run events. I was working an event market. And I was managing growth for them, five cities and expansion in two. It was a lot of fun, learned a lot about marketplaces. I started holding small events there. I started in a conference room, just ten people and that moved into the living room of the office when we had, like, twenty people. And then we started having to clear desks away, we had fifty people. And part of this big ‘aha’ moment of me doing this was I knew better opportunities would come. I took a 50% pay cut just to make it in to San Francisco and become the Head of Growth for a company. But I knew eventually if I started doing my own thing again I would get paid maybe 2-4 times more. And it’s just how it works. As long as you have a good connection base to rely on for incoming opportunities regarding consulting. Ander: Right. And then you ended up cultivating this event-focused community for marketers in the San Francisco Bay area but also this really powerful Facebook group where people are sharing resources and all these other things. It’s really incredible what you’ve done. Josh: Thank you, man. I really appreciate it. The Facebook group actually came about because while throwing all these events, I was noticing, like, ‘Hey, what happens if I, you know, work in a new company? Do I just stop throwing events? How do I build an asset that stays with me? And I came across this James Altucher post. He’s this famous writer for people who don’t know. He’s really popular on Quora, LinkedIn, as well as a number of other platforms. And he said, ‘Here’s how you build transferrable assets: the best transferrable asset is relationships. And if you really want to build relationships, you have to start a community.’ And I said, ‘Well, what type of community would go wherever I went?’ and that was an online community. Josh: An online community can give you freedom. Ander: That is awesome. And obviously within your online community, there’s a huge variety of different types of people in it. I’m a part of it and I do marketing at Instapage. There’s a lot of people who are running their own businesses. I imagine there are some enterprise-type professionals in there as well. And I think that one of the misconceptions that a lot of people have about communities is that it’s more focused or it’s more valuable, so to speak, for people who are just starting to gain that initial traction or solopreneurs or people who might be operating small or scale businesses. But I would like to think that there’s opportunity for bigger companies to leverage this kind of community building like you’ve done. Is that something that you’d agree with? Josh: I entirely agree with it. And I would say it’s shocking me how many larger companies don’t have communities. I don’t necessarily understand why but I do think, you know, if I had to pinpoint it it’d be because people are afraid of being vulnerable and open about their company on all aspects. Once you have a community, it forces you to be 100% transparent, which many people can’t handle. Josh: Because that’s what they demand from you. You need transparency to create content. If you don’t have transparency, then people will stop following you. You have to be open about your failures and your wins and most companies don’t want to do that. Ander: Right. What’s a sign that you are not providing the level of transparency that is needed to run that type of community? Josh: One is you don’t talk about your failures; you only talk about your wins. And that’s one of the biggest things I teach people is if you want people to listen to your advice, such as, ‘Hey, you should do this in growth.’ They should know that you went through, you know, maybe a couple of failed start-ups, you worked at some successful startups, and they should know the numbers behind it, they should know the stories that happened within those start-ups so they trust you. They can trust your opinion. But if you just give them straight advice, they’ll never listen to you. So it’s the people who actually talk about the pain and talk about the stories that they’ve gone through – those are the people who build real rapport. Ander: Yeah, that’s really cool. And, you know, this is something you mentioned earlier, that I think that one of the biggest problems in marketing among start-ups – and among larger companies too – is the lack of personification that companies are creating for themselves for their customers, whether that’s B2B or B2C. And I think that this is something that I mentioned in a few of the other episodes, but it’s so easy for us as users of a product to forget that there are people behind their products who are succeeding, who are failing, who are encountering all of these troubles, and working really hard to make something successful. My thinking is if companies are willing to showcase their struggles, to showcase what’s working and what’s not working – specifically for them and even huge companies – it’s going to make the company more real and it actually illustrates that the people at this company are working really, really hard to make something valuable. Josh: 100%. I think that the more vulnerable you are, you give the opportunity for others to be vulnerable as well. What this means is hey, if I produce content that talks about my story, then the people in my community will be willing to talk about their story. And if they talk about their story, then that may be thousands of stories. Thousands of stories gives you all the content you’ve ever dreamed of, right, if you look at that from a marketing perspective. And I find that to be powerful. Ander: Not to mention the research opportunity there. You’re learning so much about your users in that community when you provide them with a platform to tell their story. Josh: Yes, and I think that’s a remarkable part too. I do a lot of polls so I can figure out what they like, what they don’t like, but also through their stories. I am very careful about who I let into the community. We vet every single person. And it shows because, you know, I’ve done exports of other people’s Facebook groups and their communities just, you know, looking at the different job titles, and there are communities that are founder communities with maybe 24,000 people. Even though we have only, you know, a little over 14,000 people now, we actually have more founders because we do better vetting. Josh: That plays a lot to our strength, understanding what type of content to produce and to keep people happy week after week. So if you have a ton of people in your community, it’s much harder to keep track of them. You don’t need millions of people; you just need the people who are your strongest supporters. Ander: Yeah, for sure. Is there anything that has really surprised you as you’ve engaged in this whole process? You built this community up to 14,000 people, it’s gotten you some really cool opportunities to speak with really, really cool people and many other things. I’m wondering…what has surprised you? Maybe there’s that you haven’t told anybody before. Josh: I would say I’m surprised that people actually came out to help me when I wanted to start a business and I kept telling my story. Josh: I would say that was the most surprising part. And it sounds like it wouldn’t be surprising… Like, why wouldn’t people help you especially if you’re giving them so much value? But here’s the thing – especially coming from the background of being a failed founder working from other failed start-ups and then having a big ask such as saying, ‘Hey, I’m finally selling something right now and it’s not an e-book. I’m starting an agency and looking for clients in your community,’ and just hoping that they say like, ‘Hey, we trust you enough to work with you.’ That was a huge step for me. And it sounds simple because, like, why wouldn’t they do that? But there are so many people who are community managers and when I was at Facebook’s community summit, you know, I met hundreds of them. And the one thing that all community managers struggle with is asking because, by nature, they’re 100% a giver, right? Ander: Oh yeah. Totally true. Josh: So that was this huge ‘aha’ moment. I was like, ‘Ok, it’s fine to ask, even on a very high level and often, as long as you’re giving a lot of value.’ And in return, it’s helped tenfold to say the least. Ander: Yeah, that makes perfect sense. And I saw that you were able to connect with Mr. Mark Zuckerberg himself when you were at that conference, which is especially cool. Josh: Yeah, Mark is awesome. Honestly, it’ so funny… So, when I there I didn’t go to any of the workshops. I decided to stay out and work. And Mark’s not going to go to any of the workshops so he just walks up to me and he’s like, ‘Hey, dude.’ And I turn around and I thought I was going to have a heart attack. I was like, ‘Oh, man. This is Mark Zuckerberg!’ And he just sort of surprised me out of nowhere, right? Ander: Yeah, yeah. That was a great introduction there. Really like that. So Josh, turning this conversation towards the future, what do you see in the future of this Facebook group? There are so many valuable resources that I’ve encountered there and that other growth marketing friends of mine have encountered. It’s a fun place to ‘hang out’ on Facebook, if you know what I mean. But what can we expect to see in the future? What are some of the new things that you might be toying around with? Josh: So what I’ve noticed is I’ve been getting feedback from the community and they told me, you know, one of the most valuable parts about what I do is actually my copywriting skills. They say, ‘Nobody writes copy like you do.’ And I had spent some time as a copywriter – we talked about that earlier – and that really helped, as well as writing over 2,000+ posts. So I’ve honed my copywriting skills to the point where I know that my piece of copy will perform almost every time and people just want to know the magic behind that. So I’ll be diving into that soon as well as focusing more on marketing through engineering. We do plan on releasing a couple more Chrome extensions. Josh: We have a Chrome extension that downloads… if I say it then I know other people might do it. So I’m trying to be careful, right? Haha. Ander: Haha. Yeah, yeah, yeah. No, you don’t want to give away the secret sauce! Josh: We have a Chrome extension that’s going to download LinkedIn videos. LinkedIn just came out with videos. And one of the most baffling tools ever on the internet is the tool that downloads Facebook videos. So this was a big ‘aha’ moment for me. I was like, ‘Oh, wow. LinkedIn just came out with video. We’re going to be the first person to create a tool that downloads LinkedIn videos. And then we can upload it on Facebook, wherever it is. The other Chrome extension actually goes into your newsfeed and pulls out every piece of content that’s shared or has a link in it and we call it ‘Your Native Feed.’ That’s shared or has a link in it is just removed and you can just see the posts that actually people create themselves. And we thought that would be a really interesting idea because I’m a big promoter of consuming good content. Josh: And I think that’ll help people get on the track of doing it as well as maybe stir a little controversy, a little bit of buzz. And it’s just a fun project. Ander: Yeah, for sure. And also looking towards the future I’m very excited about every single thing that you just said, but what would you say is in the future of marketing? Where is marketing headed? And more importantly, what can we as growth marketers do to prepare for this coming future? There are so many things, from AI to the insurgence of more branded-oriented content that’s more qualitative in its nature. What do you think is happening with marketing? Josh: I think people are being forced to become more transparent, and much faster than they want to. And part of this leads to a huge opportunity for marketers who are willing to be transparent about their stories. You become an influencer in a year across multiple platforms like I did just through being honest about your story. I didn’t use heavy automation for a lot of what I did. I went from, I think, 1,500 followers on LinkedIn to 20,000 in over three months just posting organic statuses about my story and my life. Ander: That is very awesome. Josh: They’d rather start their journey at the top. Ander: And on somewhat of a different note, it’s almost therapeutic to get those elephants out of your closet and tell your story, especially your failures. Josh: Yeah, 100% agree. I think it does really help you move forward too and one of the things that I have learned. I read this book and it talked about organizing information within your mind. The book is actually called The Organized Mind. Josh: And what it talks about was the more you externalize information, the more room you have to be creative and think. So I said, ‘Wow! What if I externalized all my experiences? Then I’ll want new experiences, right?’ So it made perfect sense, just tried it out, and I was writing my stories and then I looked for more stories. So I decided to, you know, have experiences in life – start a business, start a community. And it gives me tons and tons of content to write about. Ander: Josh, I love everything that you had to say during this interview and I am going to continue, probably till the end of time, looking forward to your brutally honest, in many cases, Facebook posts and everywhere else that you’re sharing your content. So thank you so much for sharing your story with us here and the audience at Advertising Influencers. It’s been a true, true pleasure talking to you today. How can people find out more about you? How can they learn about what you’re working on, what you’re doing, and how can they find this Facebook group that is so especially awesome? Josh: Yeah, so just go on Facebook and type in Badass Marketers & Founders right into the search bar. It should pop up and it should be the first one. And you’ll know. Just look at the cover photo. It’s me in the cover photo with Mark Zuckerberg. Can’t miss it. And you can also connect with me on LinkedIn. If you do, please send me a personalized invite just because I have over 11,000 pending requests. But I do read the ones with personalized invites. Haha. Josh: And I will connect with you. Ander: And I believe that LinkedIn actually suggests that you should do that anyway so follow this guy’s recommendation especially if you’re going to reach out to anybody else, for that matter. Josh: Thank you. I appreciate you having me on and I can’t wait to hear everybody else’s podcast episodes. This is exciting. Josh, once again, thank you so much for making the time to talk to us here today. We conducted this call remotely – I’m in New York, you’re in LA. Really appreciate you carving out this time in your schedule. Thanks again, and I’m sure we’ll talk to you soon.